In a time when it is increasingly likely for children and teens to become overweight, it is important to understand the relationship between children’s media use and their nutrition and physical activity. Many food advertisements, advergames and product placements portray calorie dense and nutrient poor foods in ways that appeal to children and some children will engage in ‘mindless eating’ while watching a movie, internet video, and/or TV show. Research has shown that media exposure can affect a child’s food choices and eating behaviors which in turn can affect the child’s physical, emotional and mental health. How Can Media Affect a Child’s Nutrition and Physical Activity? Food advertisers go to great lengths to advertise to children, reaching them through TV commercials, advergames (branded games that contain advertising messages), websites, social media, and even packaging design. Most of the foods advertised to children are high in fat, calories, sodium and added sugar, but low in the nutrients children need for healthy development. Research has found that children who are frequently exposed to media containing food advertisements request the advertised foods and even argue with their parents to buy specific products. This is especially true for younger children who are more susceptible to advertising messages, but is also true for older children (and adults) as well. Children who eat while watching TV or movies often consume more than their bodies want or need and tend not to consume healthier snacks such as fruit and vegetables. When children are at home or indoors it is often easy for them to choose sedentary media activities such as watching YouTube, interacting on social media or playing computer games. These activities do not give kids the opportunity to use their developing muscles and burn energy. It is hard to limit your child’s exposure to food advertising as they are pervasive in today’s culture. What you can do is limit their exposure by choosing channels or services that do not include commercials or record shows ahead of time and fast forward through the commercials when your child is watching. When dining out, choose restaurants that are screen-free or seating areas that do not expose your children to the screen(s). Give your child and teen options for physical play (preferably outdoors). Choose active video games and music that will get kids and teens moving. In today’s often media saturated environment, teaching children to think critically about media is important. Critical thinking allows children to question the motivations behind different media depictions of food and how accurate they are. Children can also learn how to make their own healthy food messages in response to the manipulative pro- high calorie, low nutrient food messages they are exposed to. By teaching kids that the foods they see in media are often unhealthy for regular consumption, children will be less likely to accept what they see or hear as an indication or model for the food choices they make. Be aware of what you are watching and/or playing when your child is present. Know that even if the content seems to be appropriate, overexposure to food advertising can affect how children and teens act. Also, avoid snacking while using media, or limit snacks to healthy options such as fresh fruits and veggies. Additionally, turn off all screens and devices during meals. Keep TVs, computers and video game systems out of children’s bedrooms, and make sure that all other internet connected devices such as tablets and smartphones are left in a common room or your bedroom to charge overnight. By keeping these electronics in a common area, parents can monitor their use much more easily and help limit children’s exposure to advertising. 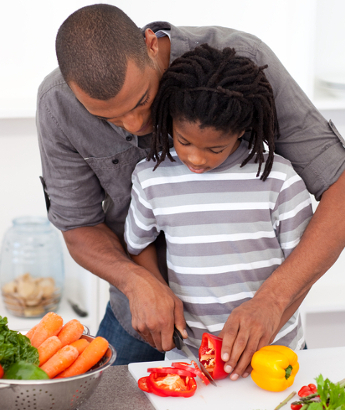 Do you know a teen who wants to learn more about healthy eating? Visit the Center for Young Women’s Health at Boston Children’s Hospital.